Bacon has long been one of the most popular and prominent components of American table fare. ย“Bacon and eggs” just rolls off your tongue long before the waitress at your local diner can get your cup of coffee set before you. The BLT celebrates all that’s right with one of the summer’s simplest sandwiches. And burgers? Well, why have a cheeseburger when you can have a bacon cheeseburger? Building on those red-white-and-blue foundations, author Jennifer L.S. Pearsall has taken all the savory, smoky-sweet goodness that is bacon and elevated its status. Working this succulent cured meat into dishes ranging from comfort to extraordinary, basic to complex, and across the spectrum of breakfast, lunch, appetizers, dinners, and dessertsย—yes, desserts!ย—Pearsall has taken the uses of bacon to new heights. 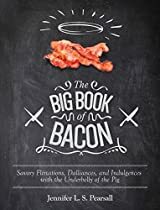 As she puts it, ย“I can’t think of anything bacon doesn’t work with.” There’s just something about it that seems to complement every other food it comes in contact with and across the range of sensations we normally associate with tasteย—salty, sweet, sour, and bitter. But, during Pearsall’s time in the kitchen putting together this book, she found that bacon also qualifies as umami, that fifth taste sensation that, roughly translated, simply means ย“good flavor.” Sure, bacon can be a dominant feature in something like a well-topped burger, a place where you really want to taste the bacon as a whole. But dice it fine and work it into a dessert crust, a bread dough, pulled pork, anything, and now you’ve got a dish that just has something. Something more than it did without this wonderful meat! Skyhorse Publishing, along with our Good Books and Arcade imprints, is proud to publish a broad range of cookbooks, including books on juicing, grilling, baking, frying, home brewing and winemaking, slow cookers, and cast iron cooking. We’ve been successful with books on gluten-free cooking, vegetarian and vegan cooking, paleo, raw foods, and more. Our list includes French cooking, Swedish cooking, Austrian and German cooking, Cajun cooking, as well as books on jerky, canning and preserving, peanut butter, meatballs, oil and vinegar, bone broth, and more. While not every title we publish becomes a New York Times bestseller or a national bestseller, we are committed to books on subjects that are sometimes overlooked and to authors whose work might not otherwise find a home.